Having staged ten very successful exhibitions, coupled with a number of initiatives to establish a very positive and forward looking image, the British Virgin Islands Philatelic Society has been described as “one of the best organized stamp clubs in the Caribbean region”. The Society was originally founded in 1985, with the prime object of catering for the needs of collectors in general, be it stamps, coins or phone cards, and has assiduously promoted and developed the various cultural and educational aspects of the collecting hobby. “BVI stamp shows highlight the educational facet of stamp collecting and have truly become a fully fledged cultural experience,” says American Philatelic Society (APS) Past President, Peter P. McCann, PhD. The club has shown itself to be enterprising in successfully promoting philately in local schools, that include the Althea Scatliffe and Enis Adams schools, as well as St. George’s School. From an international standpoint, the Society has received a number of distinguished guests from overseas, including among many others, postal historians Edward Proud and Denis Vandervelde, former President of the International Federation of Stamp Dealers Association (IFSDA) Paolo De Rosa, and Italy’s Roll of Distinguished Philatelists Colin Pilkington. Noted experts on Iranian philately and postal history, Dr. John Ultee and Bjorn Söhrne, as well as former editor of The American Philatelist, Bill Welch, also visited the Society. Other distinguished visitors included: Ted Proud, Colin Fraser, Silvia Vaccari, Peter Jennings and Gustav Pohlig. 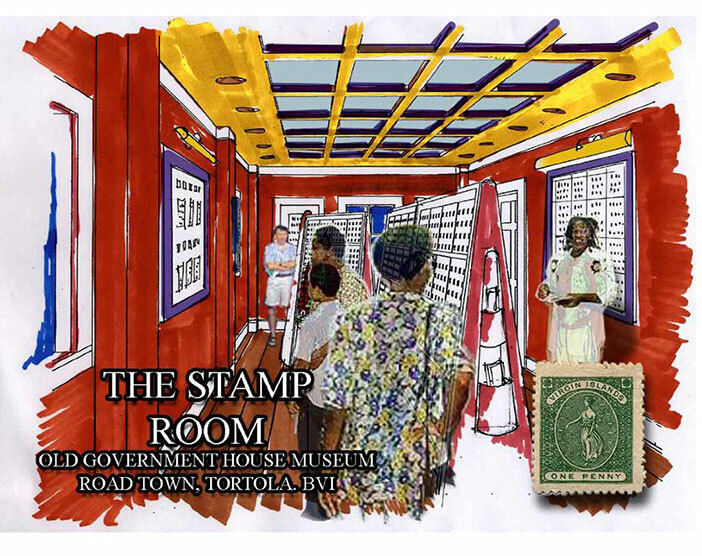 In the early years the Society loaned two philatelic exhibits to the Virgin Islands Folk Museum, and arranged two most successful slide shows presented by Giorgio Migliavacca and Jay Fredrick, who was the then President of the British Caribbean Study Group, the subject being the Postal History of the Virgin Islands. This was part of a series of lectures by the Virgin Islands Historical Society. In 1990 the BVI Philatelic Society staged its First Annual Stamp Exhibition commemorating the 150th Anniversary of the Penny Black; the show was well attended and similar and more successful shows were held in the years that followed, culminating in the 7th Annual BVI Stamp Show in 1998. This was at the new and spacious premises of Barclays Bank in Road Town, the capital of the BVI. Prior to that, philatelists participating in the 1995 APS Stamp Cruise had visited Tortola and the local club gave a memorable welcome cocktail party. On May 1 and 2, 1999, the BVIPS hosted the international meeting of the Italy & Colonies Study Group in celebration of their 25th Anniversary. Some 50 ICSG members enjoyed the “exotic outing” immensely. The Missing Virgin, three Bermuda Perots, and other rarities from Turks Islands, Montserrat and Cayman Islands were part of the splendid exhibit from the Royal Philatelic Collection at the 10th Annual British Virgin Islands Philatelic Exhibition held in Tortola on November 2 and 3, 2002 at Barclays Bank, Road Town. The BVI Exhibition’s Court of Honour featured a selection of Virgin Islands and Caribbean rarities from the Royal Philatelic Collection. Exhibited by gracious permission of Her Majesty, the occasion marked the first time such priceless gems were on display on this side of the Atlantic, and to celebrate the event and greet the BVI Philatelic Society on their achievements, the prestigious British Caribbean Philatelic Study Group (BCPSG) held their Annual General Meeting in the BVI concurrently with the stamp exhibition. The Group hold their AGM in the Caribbean every four years and the 2002 AGM was the second time Tortola had been selected for such a distinguished gathering of eminent specialists and renowned philatelists from all over the world. So far, for each of the ten Tortola stamp shows the Society has published a booklet averaging 70-80 pages and featuring interesting articles on philately and postal history. Many of these have then been reprinted in Gibbons Stamp Monthly, The Stamp Lover, Topical Time and other popular stamp magazines in Switzerland, Italy, Canada, India and Australia. The Postal Administration of the BVI has also authorised a special postmark for each of the ten shows which have been held to date. During the late 1990s, and with the collaboration of The Island Sun newspaper the Society conducted a BVI Stamp Popularity poll whereby the public vote for the best and the worst BVI stamp set of the year. Additionally in 1995 and 1998 the Society, in a joint effort with the Postal Authorities and the Department of Education & Culture launched a “Design a Stamp” competition for students of the local schools. Winners in the various age brackets have so far contributed successful designs for the stamp sets devoted to Christmas 1995 and Festival 1998. The competitions were generously sponsored by Barclays Bank Plc. The Society’s president has been a member of the BVI Stamp Advisory Committee since 1987, thereby making a valuable input and bringing a collectors’ perspective to the islands’ new stamp issues. The Society has a membership of about 45, including a number from the USA, UK and the Caribbean. Members receive a bulletin outlining upcoming activities and minutes of the meetings, as well as the stamp show booklet. Once a year the Society holds a seminar to discuss a variety topics and to help new members present a display at the stamp show; the seminar customarily ends with a popular buffet dinner. Regular meetings are held every other month, but in the two months preceding the stamp show additional meetings are held every Saturday morning at a local restaurant. The Society has been able to purchase some 25 standard (16-page) exhibition frames, and important collections have been displayed at BVI stamp shows. For three consecutive years the Doyen of Postal History, Robson Lowe has sent some very impressive exhibits (Chalon Heads, Napoleonic letters and autographs, World War II in Africa). APS President Dr. Peter McCann exhibited his gold-medal collection of Virgin Islands Postal History, and Gustav Pohlig exhibited a selection of his POWs collection. In 1998 and 1999 the Liechtenstein Postal Museum participated with some very impressive exhibits. The Society has become an APS Chapter in an effort to expand its overseas membership and boost interest in British Virgin Islands and Caribbean philately. Since 1995, the BVIPS is also a member of the Inter-American Federation of Philately (FIAF). With a population of only 24,000, some of the ajor challenges to the BVI Philatelic Society are to keep interest alive by staging shows that have as broad an appeal as possible, and ensure membership becomes stabilised and possibly increase it. In many respects the BVI Philatelic Society has some unique features that make it different to the average type of stamp club. The tropical setting, with consistent support from the local government and business community, and a resident rather cosmopolitan membership (as opposed to overseas members) including natives as well as nationals of Britain, Italy, USA, Panama, Canada, Germany and a number of other Caribbean islands. In recent years, at least three members of the Society have exhibited at major USA stamp shows winning a total of some 12 gold medals, countless vermeil medals, four APS Research Awards, three APS medals of Excellence, four AAPE special awards, a grand award in literature class, and a grand award in display class at Americas 99. Another challenge has been to cultivate members who have collections with a potential for exhibiting at many American stamp shows. There are also some unusual rewards in the Society’s activities aimed at promoting the BVI in the stamp world. As a result the BVI has succeeded in attracting the attention of the moguls of the the stamp industry and we have learned that one of the 850,000 International Business Companies (IBCs) registered in the Territory is Philatelic Rarities Limited, BVI. This company trades in rare stamps using the services and management of the Geneva, Switzerland, based David Feldman S.A. “A few years ago Feldman auctioned the famous Mauritius Collection formed by Japanese tycoon Hiroyuki Kanai for a grand total in excess of US$14million. Other important IBCs linked with the international stamp market are also known to be registered in the BVI,” says BVIPS president Giorgio Migliavacca. “What makes the BVI Society such an outstanding model to emulate is the way it involves the local community in its activities…the public comes to the two-day exhibition in droves…and the annual program is always filled with articles about the philately of the BVI.” Dr. McCann wrote. 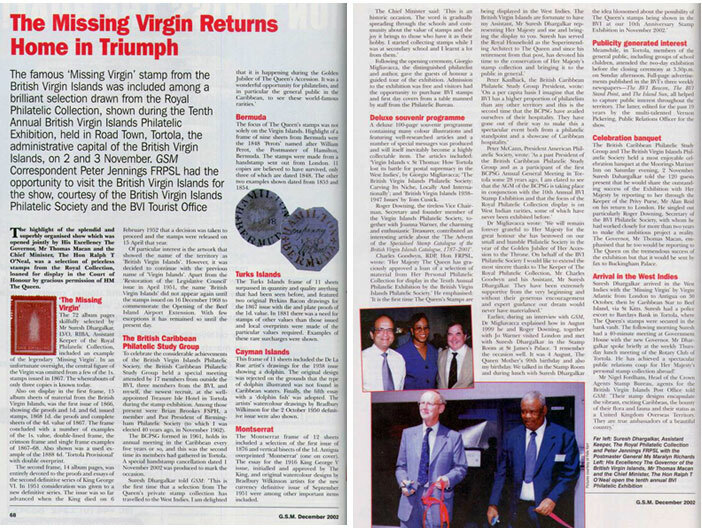 The BVI Philatelic Society, under the aegis of the “Millennium Project” Committee, has published the first ever SpecializedStamp Catalogue of British Virgin Islands 1787-2001, to be followed by a companion volume some time in the future. The hardbound Catalogue (312 pages including 16 color plates, A4 size, hardbound) provides compact, easy-to-follow, exhaustive technical data,most of which is the result of 30 years of research, making this attractively produced Catalogue a standard reference for many years to come. Specialists will be pleased to find an unprecedented number of detailed illustrations of positional and plate flaws, including a five-page bibliography and substantial new discoveries and information. This impressive Catalogue includes postal stationery, and a detailed listing of postmarks. 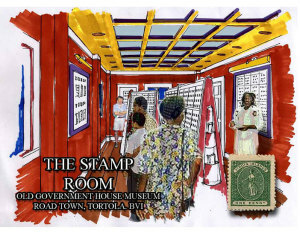 The Stamp Room at the Old Government House Museum opened in November 2006; it houses a virtually complete collection of B.V.I. stamps. It is the only collection in any museum in the Caribbean that contains a complete representation of all basic issues of the host country. This impressive collection is owned by the B.V.I. Philatelic Society, but is on permanent loan to the Old Government House Museum. The Stamp Room itself was made possible thanks to a fundraising project by the Philatelic Society. Due to some very generous donations from members of the public and the B.V.I. Government, enough money was raised to refurbish and make alterations to the room, including the installation of air-conditioning and dehumidifiers to help maintain the optimum environment to protect the collection. To further safeguard the stamps, all of the archiving is done using acid-free paper and the stamps are mounted using inert materials. The Stamp Room was made possible through the efforts and invaluable professional input of long serving BVIPS Secretary Roger Downing. The stamps of the BVI belong to the extremely, and deservedly, popular group of West Indian stamps. Commenting about the classic issues of the islands, Fred Melville, one of the most famous philatelists of all time, said: “among all the fascinating pages of the well-filled stamp album, few are so arresting to the collector and to the profane alike as those devoted to the stamps of the Islands of Virgins”. Modern issues have also attracted many more collectors . In fact, some design elements of BVI stamps issued during the last thirty years are unique in the world because they include either the Queen’s cameo (or alternatively the royal cipher) and at the same time show a currency expressed in U.S. dollars, while the inscriptions clearly read British Virgin Islands. Anyone who has travelled through the Caribbean will have found the BVI to be a delightful haven. Stamp issues have remained moderate both in their numbers each year and in face values, yet the designs are always very attractive and have a relevance to the people of the BVI. What is perhaps surprising is the stamps attract new generations of collectors and show a regular appreciation in value on the international philatelic market. British Virgin Islanders are proud of their stamps and believe that these little bits of perforated paper have far more than mere face value. They are both a testimony and reminder of their history, traditions, folklore and culture. When natives and residents send a letter abroad they know that the first image foreigners have of their county is the little vignette depicted on the stamp. These stamps are truly the ambassadors of the British Virgin Islands. Always popular with collectors the world over, the British Virgin Islands stamp issues have captured the real identity of these paradise islands, coupled with historical and important world events. These idyllic islands, a highly regarded and renowned Caribbean tourist attraction, have also stamped their presence in philatelic albums for over 135 years, and in the future will continue to develop as one of the premier stamp issuing countries of the West Indies.